We’re taught that ancient literature is great art, but that it doesn’t have anything to do with living our lives. The truth is that literature which has stood the test of time is great art exactly because it is about living our lives. The best of these ancient works attempted to answer one question: How should you live your life? And that makes sense. After people move on from the question, how are we going to find food and shelter, they finally have the time to ask, how should we live our lives? The most common definition of “arête” is “excellence.” And that’s a pretty good definition if we’re looking at “arête” as just a word on a page that needs translation. But we need to dig deeper if we want to find out why Homer thought it answered the question, how should you live your life? Digging one level deeper, we come across another definition. “Courage.” Again, a good definition if you need to do some translating, but it’s still doesn’t answer our question. So we dig deeper and find “strength,” and now we’re sure we can translate “arête” whenever we come across it. One of our definitions will definitely work. But if we stop here, Homer, himself, would tell us that we missed the point. So we have to dig even deeper. We have to go on a real archeological dig into the wisdom of ancient times. But it’s worth it because it doesn’t take much longer before we find Homer’s answer to the question, how should we live our lives? In the Iliad and the Odyssey, Homer’s main characters all embody “arête.” But for each of them, this “arête” is different. That is, each character has their own individual “arête.” They all have individual strengths. And when they focus on those strengths and exercise them, they embody “arête.” So it’s not being excellent at something that reflects this quality. It’s embodying that something. It turns out that “arête” means excellence only in the sense that you’re embracing your strengths. Embracing what you do well. Whether it leads to actual success or failure is not the quality of “arête.” It often can lead to excellence, but not always. “Arête” is the act of exercising your strengths. It’s using your mind and your body and your emotions to get as close to realizing your potential as possible. That’s how we should lead our lives. 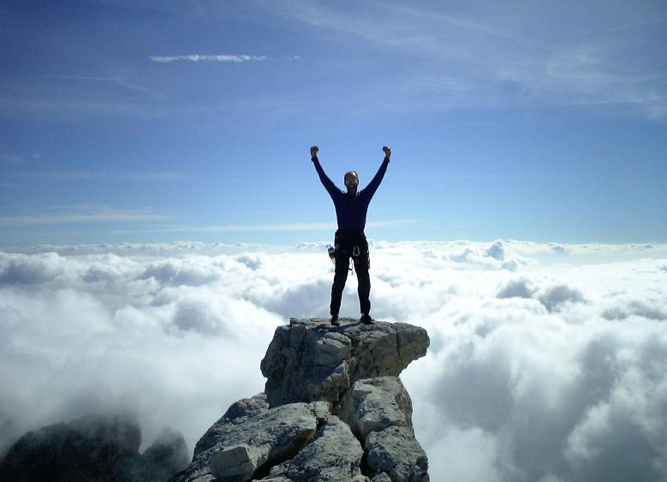 Whether we achieve success or not, we embody “arête” if we do what we should be doing. And that brings us back to courage and strength. It takes courage to be honest with yourself about what you do well. It’s a moment of truth. The moment when you ask yourself not what you’d like to do well, but what do you do well. And the answer to that question may not be what you’d like. And that’s tied to the Greek concept of fate. Cold, hard fate. The Christian version is warmer. God has a master plan. But it’s still the same idea. What we do well is what we do well, regardless of what we’d like to do well. “Arête” says embrace it. This doesn’t mean that now that you’ve found the courage to be honest with yourself, it’s going to be smooth sailing. It’s still not easy to perfect what you do well. This is where strength comes into play. It’s going to take strength of character to do the hard work it takes to embody “arête.” But rest assured that it will be “right” work. The work you were intended to do. And here are a couple of clarifications that Homer didn’t make. They apply more to modern times than to ancient times. First, when you’re discovering what your strengths are, don’t dismiss what others say. “Arête” doesn’t mean that you have all the answers. It doesn’t matter how you come to find you what you do well as long as you find out. And secondly, “arête” doesn’t mean “do you what you love.” It means love what you do. It means accept what you’re meant to do, then live up to your potential by doing your best to excel at it. Homer wrote the Iliad and the Odyssey to entertain and to teach. But today we look at those epic poems as great works of art and stop there. We find beauty in their prose and we forget the reason those works survive. I was lucky enough to have read those poems and studied them in college. But it was an intellectual pursuit. I sensed that there was more to those poems, but my teachers never dove into those parts. And I couldn’t figure it out on my own. The idea that the Iliad and the Odyssey could teach me something about how to live my life never occurred to me. It took many years before that I understood the ancient wisdom found in those works and even longer to try it out. Don’t wait as long as I did. Irving Belateche is a screenwriter, author and speaker. He’s just published the book, “Under An Orange Sun, Some Days Are Blue,” available on Amazon. It’s a work of motivational fiction where both ancient and modern wisdom is tested to see what works and what doesn’t. He’s written screenplays for Paramount, Columbia, Warner Brothers and other studios. He lives in Los Angeles with his wife and son. Pingback: 6 Habits That Will Make You Grittier and Put an End to Being a Quitter | Learn how you can create a reliable residual income.